Today I'm so excited to have Cyndi Tefft, the author of the YA paranormal romance novel Between here to answer some questions. I loved Between and encourage any fan of YA, especially fans of paranormal YA and romance, as well as Christian fiction fans to check it out. 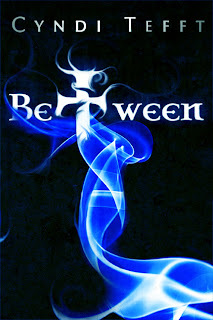 Read my review of Between here. Please join me in welcoming Cyndi! What inspired you to write Between? I wanted to write a good-versus-evil story but I felt that angels and demons had already been done quite a bit. The grim reaper is a well-known concept, but hasn’t shown up much in romance novels. I figured that I could do whatever I wanted in the afterlife, since there are no set rules. The hero is Scottish because I was reading Diana Gabaldon’s Outlander series at the time and was completely enamored with Scotland. Still am! There is a Christian element to Between. Does your own faith influence your writing? Absolutely! Still, I want to be sure no one believes I am painting a true picture of the afterlife. I don't honestly know what I'll encounter after I leave this world, but I would be perfectly happy to meet a hunky Scottish Highlander on the other side! Faith is an important aspect of my life. I wanted to portray characters in an honest way, people who struggle with belief while still reaching out to God in times of trouble. Each one of us is at a different place spiritually but death levels the playing field, bringing the question front and center. That's what I enjoyed about starting the book at the end! Are you a reader? What are your favorite types of books to read? I love reading, though I've really only taken it up in the last few years. My TV watching has suffered terribly as a result. :) I enjoy love stories most of all, whether that be a YA book or a romance novel (so few of which, sadly, are "romantic" in my opinion). Historical romance is probably my favorite because I enjoy the tension of sensuality and desire when cultural mores require you to keep it buttoned down. Now that Between is out (yay! ), I am working on the sequel called Hell Transporter. Aiden’s job is to transport souls from earth to heaven, and the second book has to do with his counterpart. I’ve got a cover in mind that is similar to Between’s, but with a red flame instead of blue smoke. I think it’s going to complement the first book beautifully. I am about one-third of the way through the first draft of Hell Transporter. I can't tell you much about it because I don't want to spoil anything, but let me just say, the ending… oh, you’ll like that! Where can readers find your books to purchase? Do you have online social network pages and/or web sites? If so, what are they? There are a variety of ways to connect with me online: My blog, Facebook, Twitter, Goodreads, Shelfari, and LibraryThing. I love to interact with readers so stop on over and say hi. Thanks for having me on the site. I had a great time! Thank YOU, Cyndi. I feel the same way about historical fiction! I look forward to Hell Transporter (Between #2)!